Water - We Need It! What is the Food Score or Food Grade? "Plan, Shop, Prep, and Cook"
"Carbs: Fiber, Starch, & Sugar"
Great App. Extensive Database. Nice Online Service. I lost 65 pounds using electronic diet logs over the past year and have been searching for a similar, powerful, robust application for the iPhone. I've found it! Most people are aware that eating sausage & pepperoni pizza, ice cream and lots of butter are not healthy for our hearts or our waistlines. Did you know that these same foods and other foods rich in saturated fat may be increasing the risk for developing diabetes? Foods high in saturated fats may contribute to insulin resistance in the body. This is important, as insulin resistance (defined as the body not using insulin properly) can lead to developing Type 2 diabetes and heart disease. 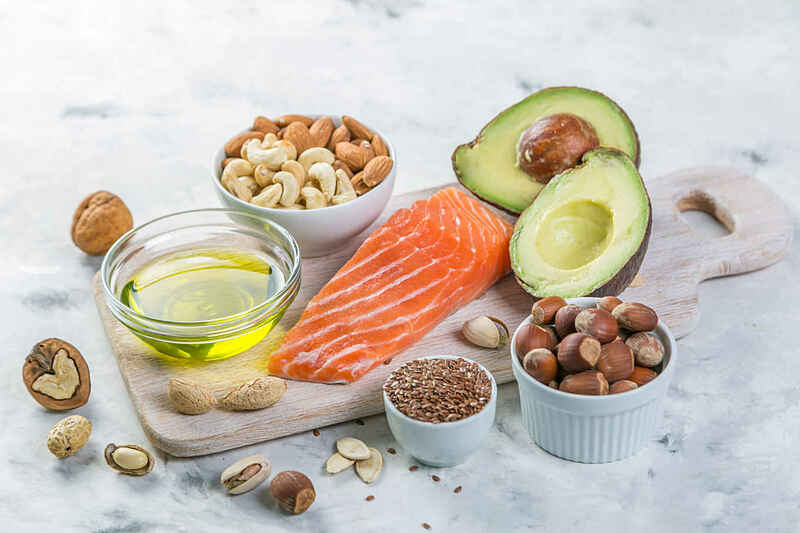 The good news is: replacing foods high in saturated fats with those rich in mono and polyunsaturated fats may in fact reduce the risk of developing Type 2 diabetes. Read on for some practical tips on how to swap out saturated fats for healthier alternatives. Eating a diet rich in saturated fats may result in less flexible cell membranes. There is some evidence that the type of dietary fat we ingest impacts the phospholipid composition of cell membranes. Phospholipids form a bilayer which make up the cell membrane and is critical for the functioning of the cell. Thus consuming more mono and polyunsaturated fats may lead to a more flexible cell membrane and may impact insulin resistance. Curious about your total fat intake and where your fat is coming from? MyNetDiary allows you to track where your fat is coming from. And if you have Maximum membership, you can also view and print nutrition reports where total fat is broken down into saturated fat, polyunsaturated fat, and monounsaturated fat. See Analysis tab in the web program for more information. At the end of the day, the healthiest diet to prevent Type 2 diabetes includes maintaining or achieving a healthy body weight, decreasing intake of of simple sugars, eating whole grains, lean proteins, vegetables and healthy fats. This, in addition to getting in 150 minutes of moderate physical activity a week and visiting your doctor to monitor other health parameters are sure to make a difference! Have questions or comments about this post? Please feel free to comment on MyNetDiary's Community Forum or Facebook page – We would love to hear from you. And consider visiting our new Pinterest page! Disclaimer: The information provided here does not constitute medical advice. If you are seeking medical advice, please visit your healthcare provider or medical professional. Avocado, Walnut, Grapeseed, Almond -- Are boutique oils worth trying? Fish Oil: Fish tale or not? For the Love of Peanut Butter! All rights reserved. MyNetDiary is a registered trademark of MyNetDiary Inc.